Beautifully engraved unissued 50 certificate from the Detroit River Tunnel Companydated 19XX. 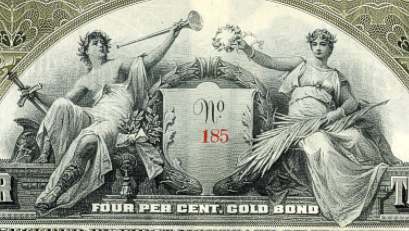 This historic document was printed by the American Bank Note Company IN 1906 and has an ornate border around it with a vignette of 2 allegorical women holding various things including a horn and a sword. In 1910, the first passenger trains travelled through the Detroit-Windsor tunnel built by the Detroit River Tunnel Company, which was controlled by the Michigan Central Railroad.